Exploring Occupy Wall Street's 'Adbuster' Origins The Occupy Wall Street movement is decentralized, but it traces its origin to a call to action in the Vancouver-based magazine Adbusters. The magazine and the movement share a common spark in the person of Kalle Lasn, a disillusioned adman. 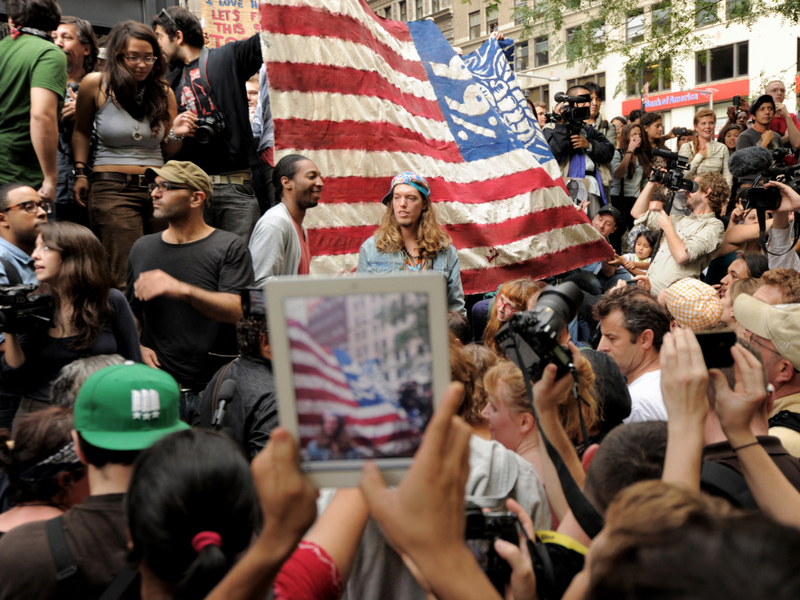 An onlooker takes a photograph of Occupy Wall Street protesters in New York's Zuccotti Park. The demonstrations were inspired by a blog post by Kalle Lasn, founder of Adbusters magazine. The protests go by a variety of names: "Occupy Wall Street," "American Autumn," "The 99 Percent." And the lack of a unified message is matched by a lack of centralized control. But the protests share a common spark: a disillusioned Canadian adman. The Occupy protests seemed to come out of nowhere. But the early participants, like John Garcia in downtown Seattle, point to a very specific catalyst. "I get Adbusters, so that's how I heard about it," he says. Adbusters is an anti-consumerism magazine based in Vancouver, British Columbia. This summer, it proposed a Sept. 17 "occupation" of Wall Street, and the idea caught fire. Adbusters doesn't claim any control over the protests. It wouldn't give NPR an interview, for instance, for fear of overshadowing the movement. It sees itself more as an idea shop, sort of an "anti-advertising firm" that takes special glee in creating fake ads to subvert the message of real products. Some of them became quite well-known, such as the magazine ads for a moribund-looking camel named Joe Chemo, and the iPhone commercial parody that cheerfully promises, "If you want to track the whereabouts of your mate 24 hours a day, every day — there's an app for that!" The man behind all this is Kalle Lasn, a puckish, Estonian-born former adman who still considers himself to be, in the language of the industry, a "creative." In a 2006 speech, Lasn said, "I have a feeling that right now, this human experiment on planet Earth is hitting the wall!" He was speaking to an audience of fellow "creatives" — graphic designers, in this case — at a conference in Berlin. Lasn lamented the environmental and psychological cost of modern capitalism, and he laid special responsibility on the shoulders of advertising professionals. "We are the cool-makers and the cool-breakers," he said. "We are the people who create the look of the magazine. We are the people who create the feeling and the tone of television or the give and take of the Internet. More than any other profession, I think that we have the power to change the world." Former advertising art director Matt Soar, who is now a professor of communications at Montreal's Concordia University, agrees — to a point. "I think it's a relatively constrained kind of power," he says. "I don't think it's an unbridled power." Soar says Lasn can get a little carried away with his vision of graphic designers as the vanguard of a revolution. But Lasn has been influential, he says, especially on younger people. "For some people who may be in, for instance, high school, it seems very, very daring to take one of these hallowed brands and either put it on the computer and Photoshop," he says, "or to print it out and start cutting it up on the table. To talk back, to subvert it — it's a profoundly important first step." And as the continuing scene in lower Manhattan attests, Lasn certainly knows how to launch a campaign.